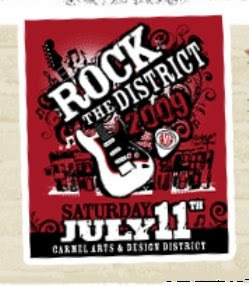 For a change of pace, I went up to Carmel to go to the "Rock the District" outdoor music event. It's held each summer in Carmel, the wealthy city directly north of Indianapolis where the well-to-do people in central Indiana live. The "District" is the so-called "Arts & Design District" in Old Town Carmel, where sadly there is very little art and only pathetically bad design. Except for events like this one and the few restaurants that are there, there is very little reason to go there. When I got there, none of the bands were playing at the moment so I traipsed down the main thoroughfare perusing what the various food vendors under their awnings had to offer. Most of it was ridiculously overpriced considering it was just carnival-like food, but the prices were probably set with consideration of the moneyed interests that live in the area and who could afford to pay up. I tried to be mindful of the good eating habits preached by Scott Herman, the fitness trainer/model from The Real World Brooklyn, who's every word I follow on Twitter. For that reason, I selected a grilled chicken sandwich. It was particularly tasty. On the other hand, I also got a tray of sweet potato fries to go with it, which were also quite yummy (but I'm confident not on Scott's prescribed diet). Since I'm a-telling on myself, I'll mention that the first thing I bought was actually a grotesquely huge bag of kettle corn. It's something to get at fairs, like elephant ears, but it's hard to say if it is as bad for you. It's popcorn that has a light coating of both sugar and salt. It just looks kind of funny for one person to carry around a duffel bag size quantity of snack food. The attendance this year was less than last year, because frankly the music headliner wasn't as big as the one the last two years. In 2007 & 2008, there was Indiana's own Jon McLaughlin, who really got people's attention in 2008 when he performed the nominated Disney song "So Close" at the Academy Awards. (BTW, I highly recommend his music). Eventually someone started playing music on the main stage. It might have been Dave Barnes, the headliner. I don't know. It was strictly straight people's music. I listened for about five minutes then left. As I left the area, I could see walking down the street, facing towards me, a solitary figure moving in a hurry. Picture an Olympic race walker, with arms pumping and hips swaying. Of course, for someone in the know, it was clear I was seeing the other gay person who decided to attend the event. As he got closer, I could see he was wearing a horribly outdated v-neck shirt, which unfortunately is a fashion cry for help that too many gay men cannot seem to release from their clutches. It was tired when Dustin Erikstrup constantly wore v-neck t-shirts two years ago on Big Brother 8. Now I see Derek Chavez on The Real World Cancun extolling the virtues of the "style" to Bronne Bruzgo. Is it possible that the trend has only recently made it across the desert to Phoenix? So anyway, the guy walking towards me eventually passes by, and interestingly he actually looked a lot like Derek. Unfortunately, he absolutely reeked of some old style cologne. He must have had it sprayed, splashed, and otherwise hosed on him. After he walked by I waved my hands in front of me in a vain attempt to clear the stench that his trail had left for to walk through. Now I am home. I have to work on moving all of my xtra pages to a real web host. I had been using an anomaly of Google's page creator to host them with Google for free. Now their page creator platform is being closed in favor of their site creator, and the anomaly has been removed. So far, it's not been too bad getting set up although as an indirect consequence, TvTrick.com was vanishing and reappearing for a horrible period of time today. I hope TrickWire.com doesn't have the same problem.